ASSP-based Development | Socionext Inc. Developing a custom SoC based on an ASSP with a proven track record in the market not only makes it easy to design the components surrounding the CPU and the subsystems. It also has the advantage of easier development and evaluation because related software is also already provided. From our experience of ASSP-based design for our product, the development period was achieved six months shorter than the development period by conventional design. This rapid time-to-market was achieved by shortening hardware design period and by developing software in advance. This section introduces one example of ASSP-based development. We extract application IPs which are required for customer's development from our proven ASSP. After cutting down unnecessary IPs and Interfaces from base platform, then we combine this optimize platform and extracted application IP. 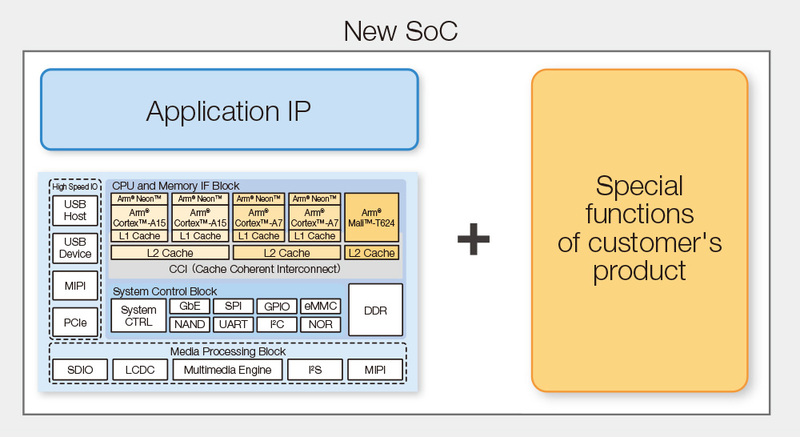 By adding your special functions to differentiate from others, your special SoC design is now created. The functions, performance, and power can be evaluated and verified using a dedicated hardware emulator at approximately 1000 times as fast as an HDL simulator. For your software development, we provide a prototype environment such as an FPGA board and CPU board. 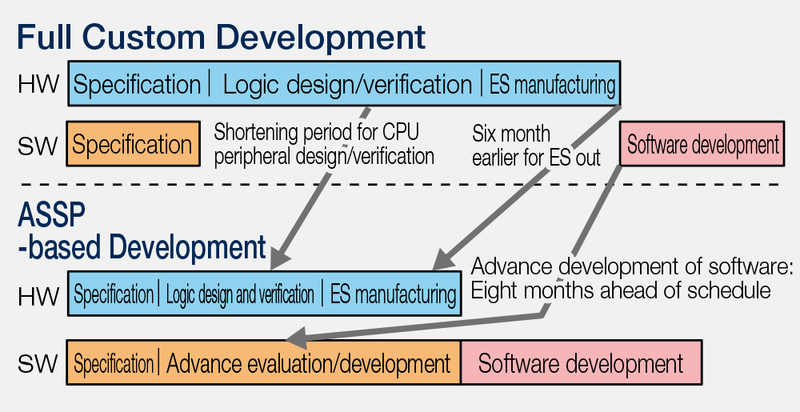 This allows customers to develop software before manufacturing SoC. Implementing high-speed components (DDR, PCIe, USB, etc.) and SoC on a PCB tends to cause a electrical issue such as electromagnetic noise, crosstalk, and clock jitter. We analyze such issue creating PCB prototype and offer proposed measures. This reduces risk associated with developing a PCB and thereby reduces cost for PCB design and manufacturing.